Enjoy pizza that tastes like it just came out of a brick oven from the convenience of your kitchen or grill. Baking stone cooks pizza evenly without hotspots and helps uniformly brown and crisp crust. Our baking stones are perfect for cooking and reheating bread, pastries and baked goods. These are the same baking tile we use in our wood-fired ovens. Wildwoods Baking Tile has excellent thermal shock resistance withstanding red heat to ice water quench, and then returned to red heat. Our high fire Tiles body will withstand a temperature rise from 70° to 1800° in 80 seconds, followed by an immediate room-temperature air quench. 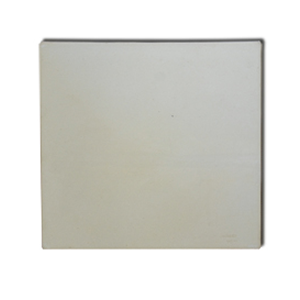 Our baker’s tile requires no seasoning or conditioning and have excellent heat retention. Start heating your baking tile by placing it on a cold grill or cold oven and then slowly heating to about 350. If you are using an indoor oven place the stone on the lowest rack possible. Let the stone come to temp for about an hour. Build your pizza on a well-dusted peel and then crank up the oven to 500 to 550. Turn your grill burners on high. Place the pizza on the stone by gently shaking it off the peel onto the stone. Watch closely and don’t let it burn. If you do it right you will eat pizzeria quality pizza. There is no better stone which is why we use these in all our factory made wood-fired ovens. Preferred by professional bread bakes for use in conventional ovens to promote rapid rise and spring when baking loaves of bread.